When no cables (HDMI or USB) are connected to the scanner it defaults to automatically booting into Wi-Fi cloud upload mode. When a USB cable is attached to a Windows PC it defaults to USB image capture mode. When an HDMI cable is attached to a display device it defaults to live video feed presentation mode. It comes equipped with a laser augmented topographical scan system in its inner "neck" to automatically "map" the surface of any three dimensional objects put within its field of view. This information enables it to not only deal with 2D distortions in a plane, but also 3D distortions that rise out of a plane, such as occurs with bound materials like a manual or book. It is notable that this scanner has [no] moving parts. Unboxing consisted mostly of taking inventory of the accessories and then assembling the two piece overhead scan unit to its base. Then securing those with two self tapping screws and covering them up with provided rubber dots to conceal them. It was relatively easy to experiment with HDMI mode, hooking an HDMI cable from the scanner to an LCD monitor produced a live image. Tip! When the Black rubber or felt mat is placed below the scanner scan head it produces a completely dark and featureless background which the live video feed will faithfully reproduce on the LCD monitor. This can be disconcerting at first.. until you place an object or your hand in the field of the view and react to the stark and sudden contrast of the object from the featureless background. Tip! You may experience the "Samsung Effect" if the HDMI input on your monitor is left to its default signal input settings. The Bias is to assume the HDMI input signal to an LCD monitor is degraded or of poor quality and to attempt to "Enhance" the HDMI input signal which produces "artifacting" and or "un-intentional aliasing" as well as distorting colors and saturation. [Be certain] that for any presentation monitor that the HDMI input signal is manually set for [PC or Digital] input signals.. as opposed to VCR or Blu-Ray or other lesser quality signals. Simply using manual controls to reduce the Sharpness and Color manipulation will unfortunately not overcome these "in-store" demo modes and biasing presets [built-in] to the modern LCD monitors and presentation devices. Consult the youngest member of the household or a regular [gamer] for advanced settings advice, before considering purchasing expensive HDMI cables. Beware! The default as unboxed from a store is to [distort] true digital video signals from PC devices when using an HDMI input on a monitor, this is the normal behavior for many vendors, not just Samsung. It is simply better understood in general by the public for Samsung products. Hence the honorarium. The base of the scanner has a button for three different lighting levels by repeatedly pressing the button the light levels cycle between the three possible brightness levels. The Zoom [-] and Zoom [+] modes perform as one would expect to enlarge and reduce the field of view. The overhead scan unit also has a full color TFT liquid crystal display which is also live at the time of capture and helps to position objects within its field of view. Requires first downloading the software written for the Microsoft Windows PC operating system to a Windows 7 workstation and installing it. The software is not provided in the box and must be obtained from one of two possible download sites on the Internet. In general one site is located in Hong Kong, the other at another location more appropriate to an International user audience. Tip! The download locations are generally both constrained by the rate at which they support downloading the user manual and software. The user manual does not take much time to download. The scanning software however is over 412 MB and can take from 45 to 60 minutes depending on both your bandwidth connection to the Internet and that of the server providing the download. Plan accordingly. It is important the software be installed [before] connecting the scanner for the first time, so that alternative software drivers are not sourced and loaded by the Microsoft Windows Plug and Play device driver subsystem.. which can prevent the document scanning software from finding the Czur ET16 device upon start up. Tip! If you do rush to connect the scanner to a PC and alternative device drivers are selected and loaded by the Microsoft Windows operating system. It may require some additional setup procedures to either manually remove the device drivers while the scanner is still connected, then shutdown the PC and disconnect the scanner.. so that the scanner software and device drivers can be installed [first], the scanner connected [after] the device drivers are present, and the scanner reconnected for [detecting] and loading the proper and specific drivers for the Czur scanner. During installation the software asks for a [Serial number] which is a string of five groups of five digits each on the bottom of the scanner. There are two major strings of numbers, one just below the barcode the other offset closer to the edge and broken up into five groups of five digits each by hyphenation. The hyphenated string of numbers is the actual [Serial number] required by the software in order to install. Tip! The [Serial number] font makes distinguishing some alphabetic and arabic numerals from one another difficult. A "numeral 1" may actually be the alphabetic character "I" for the capitalized version of the "9th" letter of the alphabet. Be aware of the possible problems in typing in the correct [Serial number]. Ironically choosing to use an OCR font (while not esthetic) would make reading the [Serial number] less error prone. document scanning and ebook scanning in particular involves a [four-step] process. Any one suite of "capture" tools for the purpose of creating electronic books tends to have its strengths and weaknesses. But also the "user" often fails to realize that "digitization" is currently no less difficult a task than that of the earlier Monastic authors of the documents that they preserved. It is part artform and part data management optimization. To even get to the point at which all the choices that can be made, requires great captured media from the original material. And that requires a good scanner. 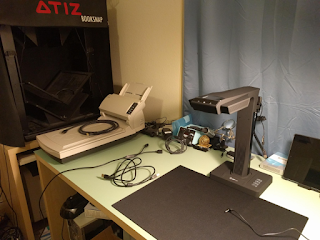 The Czur ET16 is currently a very promising entry in the personal preservation and scanning category of devices.